Availability: This product is discontinued and no longer available for purchase. For alternatives browse our Multi Gyms department. The York lat machine is recommended for light commercial use. The machine has been designed to allow the users to benefit from using a cable column for developing strength and conditioning, without the cost associated with full commercial apparatus. It features floating pulley wheels which eliminates the need for changing cables between exercises, and height adjustable, foam padded leg hold down bar for comfort. Weight carriage accepts both 1” standard plates and Olympic plates. 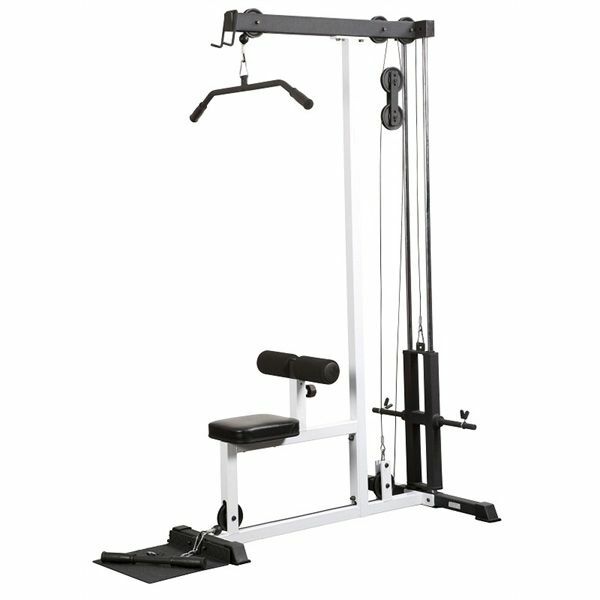 The machine comes standard with lat pull-down bar and straight bar attachments. Dimensions: Length=63", Width= 48", Height=83"
for submitting product review about York Lat Machine.